Georgia Gov. 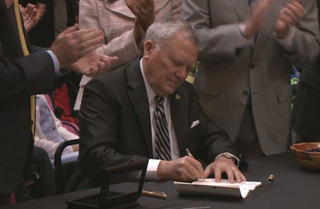 Nathan Deal signs a bill April 16, 2015, that allows patients suffering from illness to use cannabis oil as a treatment option. On Thursday, Gov. Nathan Deal signed legislation to make Georgia the 36th state, along with Washington, D.C., to legalize medical marijuana. But slow down: The Southern state isn't loosening its staunch Bible belt all that much. According to MSNBC, it is legal "for people to possess up to 20 ounces of fluid cannabis oil." However, the site adds, "The cannabis oil can contain no more than 5 percent tetrahydrocannabinoil, or THC, the psychoactive agent." According to My Fox Atlanta, the new bill, titled H.B. 1, requires a doctor's approval and prescription. The patient must also be registered with the state, which will issue a card "allowing the person to carry 20 ounces of cannabis oil." The oil has been reported to be effective in treating people with "epilepsy and other seizure disorders, Lou Gehrig's disease, cancer, multiple sclerosis, Crohn's disease, mitochondrial disease, Parkinson's disease and sickle cell anemia," the news site reports. The face of the bill, which was sponsored by state Rep. Allen Peake, a Republican from Macon, has become Haleigh Cox, 5, who suffers from intractable epilepsy and was having as many as 100 seizures a day. She was taking some six medicines in an attempt to try to get her illness under control. "She was maxed out," her mother, Janea Cox, told CNN. "She'd quit breathing several times a day, and the doctors blamed it on the seizure medications." The family heard that cannabis oil might be effective in treating Haleigh, and when her doctors only gave her three months to live, the family decidedthat they had no choice. Since the oil wasn't available in Georgia, they packed up and moved to Colorado Springs, Colo.
CNN reports that Haleigh was given cannabis oil four times a day and once at night, and she got better. "Every time she smiled, I knew we did the right thing, because we hadn't seen her smile in three years," Cox told CNN. "Now she's thriving, she's healthy, she's happy, and they're absolutely shocked at the difference. So I think we've turned some nonbelievers into believers of cannabis oil." Haleigh was on hand as an emotional Deal signed the bill. "For the families enduring separation and patients suffering pain, the wait is finally over," Deal said. "Now Georgia children and their families may return home while continuing to receive much-needed care. Patients such as Haleigh Cox, for whom this bill is named, and others suffering from debilitating conditions can now receive the treatment they need, in the place where they belong—Georgia."